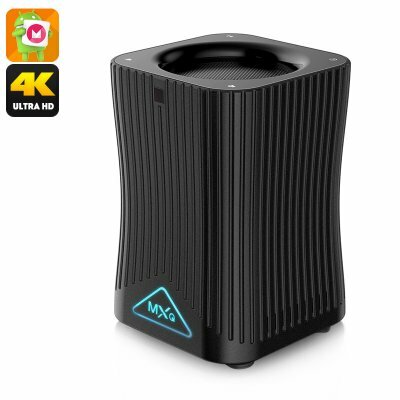 Successfully Added MXQ HF10 S905X TV Box - 4K Support, Android 6.0, Alexa Voice Control, Quad-Core CPU, 128GB SD Card Support, Google Play, DLNA to your Shopping Cart. Upgrade your home entertainment systems with the amazing MXQ HF10 S905X TV Box. This Android TV box comes with a Quad-Core processor that has been clocked at 1.5GHz. Thanks to this, it allows you to enjoy all the basic Android TV Apps and games available in the App Store. Simply open up Google Play and you’ll be treated to unlimited access to free media files. With this Android TV box at your home, you can be guaranteed that you’ll never be bored again. It comes with an Android 6.0 operating system. This means that you can be assured of a smooth user experience while using the latest software features. This Android TV box supports a stunning 128GB of external memory. Thanks to this, you can be guaranteed that you’ll never run out of storage for all your files. Additionally, it supports DLNA, Miracast, and Bluetooth to further increase your overall user experience. With 4K support, it lets you watch the latest Ultra-HD movies out there. Thanks to this, you’ll be able to enjoy your films and series like never before. Whether you simply like to enjoy a movie with your kids or watch a live sports game with your mates – this Android TV box is sure to treat you to a stunning visual experience. Dual-Band WiFi lets you browse the web at lightning speeds from your big screen TV. From now on you’ll be able to download media at any time, stream movies, and use social media applications. The TV box can be easily controlled via its remote control. What sets it really apart from other Android TV boxes, however, is the fact that it supports Alexa Voice Control. With this feature, you’ll be able to browse through your TV box by merely using your voice. Thanks to this, you’ll never have to worry about losing your remote again. Alexa Voice Control brings along great convenience as it lets you use your TV box without lifting a finger.